I’m sitting under Fishtail. It’s bigger from here than it looks in the picture mostly occupied by my face. 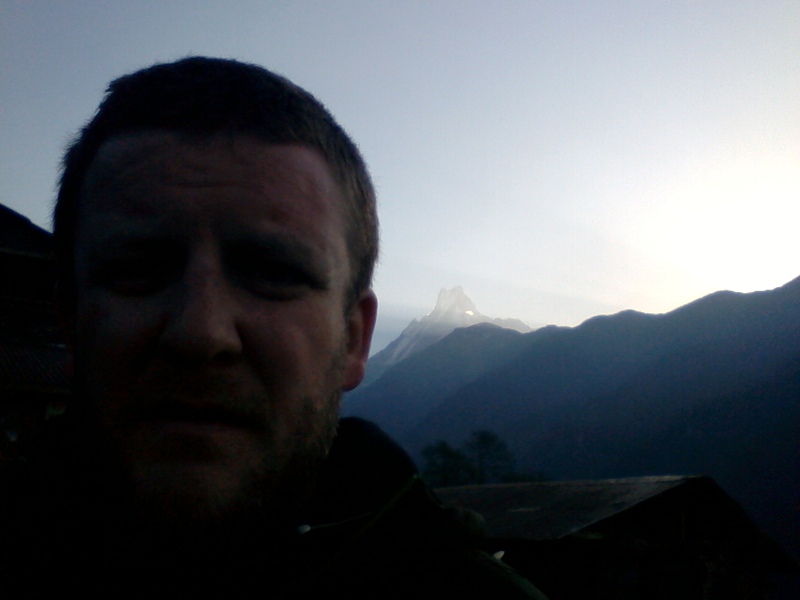 Just walked to the top of this village and back to our guest house, and from there the entire south face of Annapurna South and its glaciers are right in front across the valley. I think this is the end of the road. Stomach doesn’t feel well. Breakfast, then the trail. This flurry of posts has me feeling like I'm on a rollercoaster in fast-forward. So sorry you're feeling too sick to continue. I'll be watching your dot make its way back. It was only a flurry on facebook, which hadn't been updating my blog feed, sorry. Hey matt – Kevin here. Just to let you know, your blog is gaining quite a following among your co-workers! Also, FYI the new blackberries were distributed this week. Your old one has been turned off and I have your new one here waiting for your return. Enjoy the rest of your trip (hope you feel better for the tail end) and we'll see you on the 22nd! Thanks, Kevin. Now I won't be tempted to start on the assuredly absurd number of unread emails during my hours back in town before work. See you then.